by Robert A. Rohm, Ph.D.
Each person’s perspective is built into who they are. Different is not bad, it is just different! A lack of understanding of ourselves and others can lead to real problems such as tension, disappointment, hurt feelings, unmet expectations and poor communication. As you know, it is hard to work with a problem, especially if you do not understand what is going on inside the mind of another person. There IS a Simple Way to Understand People! The good news is that there is a simple key to understand how people behave and how they are motivated. We call the concept “The DISC Model of Human Behavior.” This concept will allow you to unlock the mystery behind developing good people skills and creating better relationships. You will be able to use what you learn in this introduction to reduce conflict, improve productivity and relate with others more effectively. Twenty-four hundred years ago, scientists and philosophers, most notably Hippocrates, began to recognize and categorize differences in behavior that seemed to follow a pattern. Since then, many psychologists and scientists have explored behavioral patterns. Dr. William Marston wrote “The Emotions of Normal People” in 1928 after earning his doctorate from Harvard University. Marston theorized that people are motivated by four intrinsic drives that direct behavioral patterns. He used four descriptive characteristics for behavioral tendencies which are represented by four letters of the alphabet: D, I, S and C. Thus the concept of “DISC” was introduced. On a side note – I learned about “DISC” over 25 years ago from a good friend who helped me to understand my daughter. The concept was so revolutionary in my own family that I began my own research. Since then I have trained thousands of people and written many books on the subject. No one is more passionate about what I am sharing with you than I am, because these are the very concepts that changed my life! Many behavioral models focus on what is wrong with a person to identify “personality disorders.” The DISC model is based on normal behavior, not abnormal behavior. DISC is a “wellness model” that is objective and descriptive rather than subjective and judgmental. Therefore, DISC is a practical way to understand yourself and those around in the common settings of everyday life. The DISC wellness model is a good framework for understanding people. DISC should be used in a positive way to encourage a person to be his or her best – not as a way to “label” someone. Healthy, positive relationships come from having an accurate understanding of yourself and others. 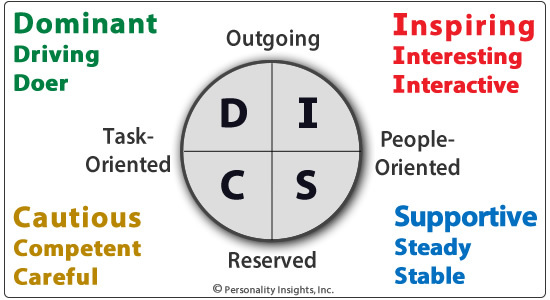 DISC is a powerful tool for obtaining a new appreciation for our personality styles and their effect on our everyday lives. We use a POSITIVE approach to highlight and encourage a person in his or her STRENGTHS. We use a POSITIVE approach to address a person’s possible BLIND-SPOTS without assuming a weakness exists. We recognize that each person has a unique blend of ALL the major personality traits to a greater or lesser extent. We recognize that behavioral patterns are fluid and dynamic as a person adapts to his or her environment. I have a saying that, “your strengths should carry you while your blind-spots should concern you.” Being able to identify and articulate your strengths can be very empowering. Being able to identify and uncover blind-spots can also be very empowering! The next few pages can be the start of your own empowering discovery process. So, now that you know where the DISC concept came from and the importance of having a positive, flexible approach, let’s take a look at the Model of Human Behavior using the DISC! Observation #1: Some people are more OUTGOING, while others are more RESERVED. You can think of this trait as each person’s “internal motor” or “pace.” Some people always seem ready to “go” and “dive in” quickly. They engage their motor quickly. Others tend to engage their motor more slowly or more cautiously. 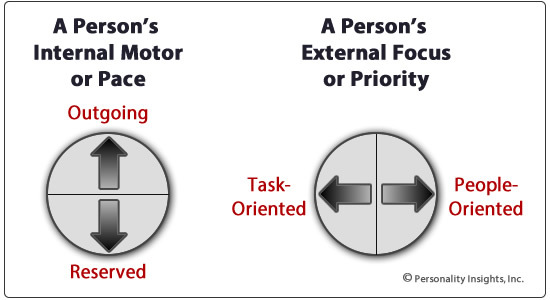 Observation # 2: Some people are more TASK-ORIENTED, while others are more PEOPLE-ORIENTED. You can think of this as each person’s “external focus” or “priority” that guides them. Some people are focused on getting things done (tasks); others are more tuned-in to the people around them and their feelings. With both observations, we want to emphasize that these behavioral tendencies are neither right or wrong or good or bad. They are just different. We are simply identifying normal behavior styles. People have different styles, and that is okay. We represent these 2 observations in the diagrams below. Next, we will add descriptive terms for each of the four main personality types that emerge in the diagram. The descriptive terms will begin with D, I, S and C.
As mentioned before, we will add the descriptive terms to the diagram. Notice the letters D, I, S and C appear in the 4 quadrants of the circle in the diagram below. You will also notice that descriptive terms have been added in each of the 4 corners of the diagram. D stands for the DOMINANT Type which is OUTGOING and TASK-ORIENTED. I stands for the INSPIRING Type which is OUTGOING and PEOPLE-ORIENTED. S stands for the SUPPORTIVE Type which is RESERVED and PEOPLE-ORIENTED. C stands for the CAUTIOUS Type which is RESERVED and TASK-ORIENTED. We spend years in school developing our intelligence to effectively use our mind. Developing our unique personality to effectively use our behavior is just as vital to successful living. Your Intelligence Quotient, or IQ, measures your intelligence. Your Personality Quotient, or PQ, refers to your ability to understand yourself and others for effective communication and teamwork. Studies have shown that technical skill, beginning with intelligence and developed through education and experience, accounts for only 15% of success in the workplace. The other 85% of workplace success comes from people skills! These skills are developed through learning better ways to behave and interact. The Elevator Test: Which Type Are You? The elevator doors are about to close on an eager rider who is trying to get on the elevator. Four people are already inside the elevator. One of the people in the crowded box is in a hurry and does not want to wait (outgoing and task-oriented). There is also a bubbly, energetic passenger who holds the door open while greeting the newcomer (outgoing and people-oriented). A third rider is happy either way and smiles while waiting patiently (reserved and people-oriented). The final passenger is concerned as she calculates the weight to see if the elevator can handle another person (reserved and task-oriented). While not perfectly scientific, this scenario illustrates the Dominant (outgoing / task-oriented) person who is focused on getting somewhere fast; the Inspiring (outgoing / people-oriented) person who is energized by all the interaction; the Supportive (reserved / people-oriented) person who reacts calmly and tries to get along regardless; and the Cautious (reserved / task-oriented) person who wants to make sure the added person doesn’t exceed the weight limit! As you can see, there were four different people who responded to the same event in four very different ways! One of the dangers of learning about DISC is that you may think you now understand all there is to know about it. We have just scratched the surface of the dynamics involved in personality styles. Did you know there are not just 4 personality styles? We identify 41 specific personality blends that are all very different. Even within the 41 personality blends, there can be a wide variety of nuances. 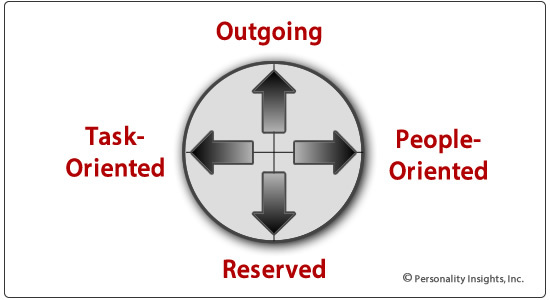 Learn about the DISC Model of Human Behavior (www.personalityinsights.com). Take a personality assessment (personality test) to determine your exact personality blend and personality profile (www.discoveryreport.com) . Study material that teaches you how to read and understand the personality of another person. Study material that teaches you how to adapt YOURSELF to work better with others. I trust this introduction will help you to experience more success in your life!